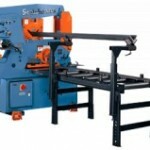 A hydraulic ironworker can be used for punching, shearing, notching, bending and other metal fabrication functions. Scotchman’s special tooling department can design any special tool you need for your metal fabricating needs. Scotchman Component Tool Ironworkers are the most versatile and dependable punching, shearing, and notching ironworkers available today. 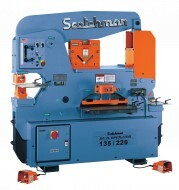 Scotchman’s unique component tool design will accept a large range of standard tools including press brakes, channel shears, rod shears, tube shears and pipe notchers. The tool table can also be used as a power source that will allow our customers to build their own tooling for all of their fabricating needs. The beauty of this machine is that it can adapt to whatever your customer brings in the door. 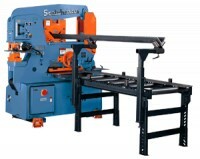 Scotchman’s fully integrated line of hydraulic ironworkers are very popular among fabricators because the punch, flat bar shear, rod shear, rectangle notcher, and the slug-less angle shear are permanently integrated into the machine. The DO 8514-20M is a Fully Integrated and Dual Operator ironworker, which allows two operators to work at the same time at full capacity. The DO 8514-20M is the most versatile fully integrated style machine in the world, because it is designed to remove the rectangle notcher and replace it with a 90° notcher, extra punch station, press brake, or pipe notcher. Scotchman Dual Operator Machines have a hydraulic system designed to assure full hydraulic pressure and speed to both operators. The DO 70, DO 95, DO 120, DO 135 and DO 150 machines feature our versatile tool table design, and come standard with a punch, angle shear, flat bar shear and notcher. The DO 8514 offers a fully integrated European design that includes a rod shear in addition to the punch, angle shear, flat bar shear and notcher stations. 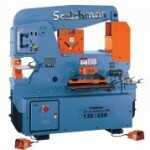 Scotchman ironworkers are designed and built to provide versatility, dependable performance and customer satisfaction. 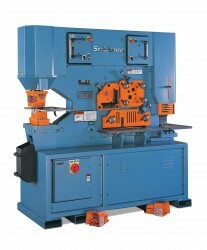 Our ironworkers can utilize optional accessories that can help you save both time and money.Scotchman has hundreds of in-stock punches and dies, as well as, conveyors andmeasuring systems for our machines. Our selection makes us the top choice for anyone searching for an ironworker punch or special ironworker tools.Over the last 40 years, Scotchman Industries has sold hundreds of hydraulic ironworkers to customers who were not looking for an ironworker, but bought the machine because Scotchman was able to build a custom tool for their special application (that mounts in an ironworker). 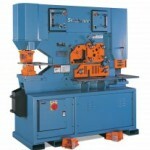 These custom tools include custom punches and dies, custom brakes andcustom tooling.